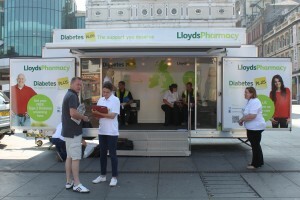 Lloyds Pharmacy Roadshow hits Liverpool! The Lloyds Pharmacy Diabetes Plus Trailer hit Liverpool yesterday for the first day of the roadshow which will cover major cities in England, Scotland and Wales. To find out more about roadshow trailers from TCM, call Lindsey on 01543 255452 and let us help take your message on the road. For more pictures, visit our Facebook Gallery! This entry was posted on Tuesday, July 16th, 2013 at 10:59 am	and is filed under Uncategorized. You can follow any responses to this entry through the RSS 2.0 feed.You can leave a response, or trackback from your own site.